A History of George Mason University | Marianne Torregrossa, Kathy Parnell, Anne Walker, [and] Jim Pracht getting out of 5 o'clock math class, Bailey's Crossroads. Marianne Torregrossa, Kathy Parnell, Anne Walker, [and] Jim Pracht getting out of 5 o'clock math class, Bailey's Crossroads. 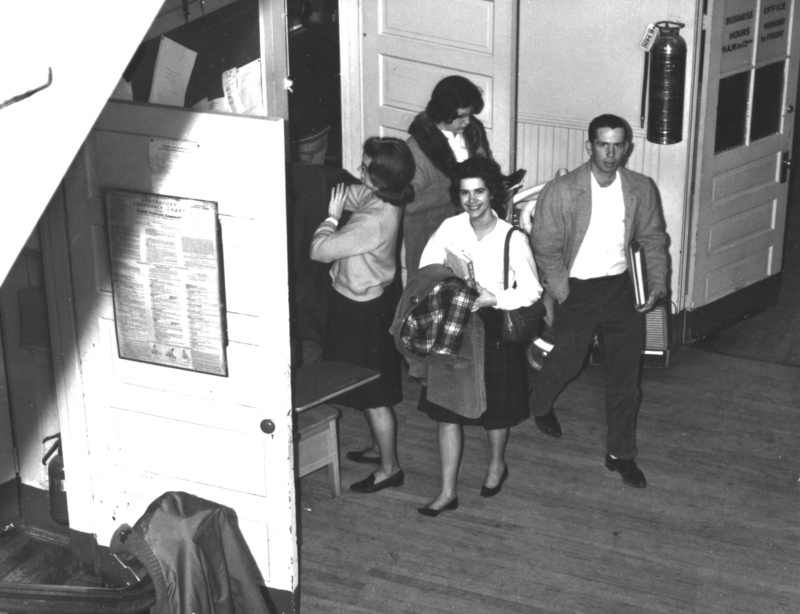 Photograph taken by Richard M. Sparks of students Marianne Torregrossa, Kathy Parnell, Anne Walker, and Jim Pracht exiting a classroom and entering the front foyer of Bailey's Crossroads campus of George Mason College, April 1964. Citation: Sparks, Richard M., “Marianne Torregrossa, Kathy Parnell, Anne Walker, [and] Jim Pracht getting out of 5 o'clock math class, Bailey's Crossroads. ,” A History of George Mason University, accessed April 23, 2019, https://ahistoryofmason.gmu.edu/items/show/53.